Sort-A-Rama is one of the largest corporate volunteer service gatherings in the area. At the event, participants sort bulk food into family-sized bags for distribution to those in need. It's a meaningful opportunity to combine volunteerism with employee engagement and customer relations. Sort-A-Rama is part of our annual Stop Summer Hunger campaign which aims to fill the summer meal gap. Sadly, no school means no breakfast or lunch for thousands of children. But with your particiaption in Sort-A-Rama, we can provide healthy meal packs for thousands of kids and their families. 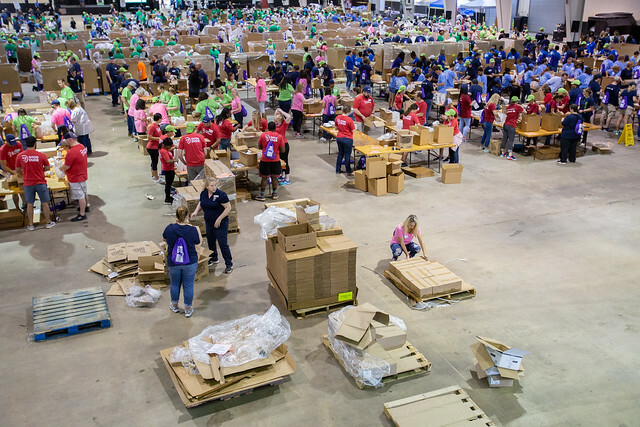 There's still time to join Presenting Partners BASF, Blue Cross and Blue Shield of North Carolina, Cisco, and Food Lion along with other Triangle companies sort and assemble 200,000 meals for those in need. Contact Jenna today! Read more about the Sort-A-Rama experience from the eyes of a volunteer: "What it Feels Like to Bag 176,000 Meals for Families in Need"
Please contact Jenna Temple, Manager of Corporate Relationships, at 919-865-3046 or jtemple@foodbankcenc.org.